The Asian American community of Chicago is diverse and has contributed to all parts of the city in many ways, but this week Mayor Rahm Emanuel fell back on old, harmful stereotypes about our community. 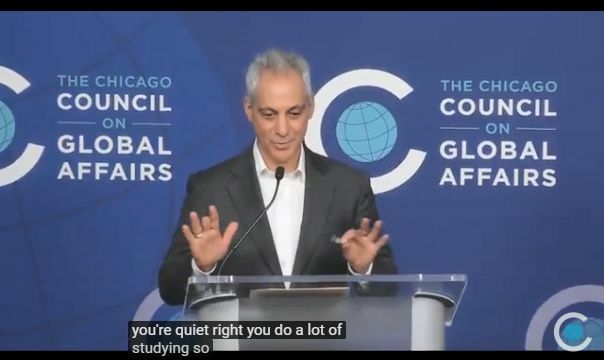 Yesterday at an event here in Chicago, Mayor Emanuel asked an Asian American student who had just introduced him on stage “You’re quiet, right? You do a lot of studying?” after first making an offhand comment asking whether they were up for adoption. Look, there are a lot of layers here, including that Asian Americans and Asian American students are pigeonholed by regressive stereotypes like the “model minority” myth, which masks the everyday struggles of Asian Americans that exist at the margins, including refugee families, undocumented and mixed-status families, and low-income communities. Mayor Emanuel used a racist trope that divides Asian Americans from other communities of color, when in fact Asian Americans have a shared stake in racial, economic and environmental justice policies that would benefit communities of color citywide. Now, we have an election on February 26 and the Mayor is on his way out of office. How can Mayor Emanuel support Asian American communities between now and when he leaves City Hall? Well, he could start by postponing any votes and committee meetings for the new police academy and Lincoln Yards development, because these developments will hurt neighborhoods across the city, including ones where Asian Americans live. Then he can read UIC’s IRRPP report on racial justice for Asian Americans in Chicago. Our community will not be used as a wedge between communities of color that we live and work with every day, and we’re tired of being treated in a way that reduces us to a stereotype. We’ll be expecting better from our next mayor.